Dieser Anwendungsbericht zeigt, dass METAFECTENE® PRO hervorragend für die Transfektion von großen DNA Konstrukten, wie das HSV-1 BAC Genom mit ca. 153 kbps geeignet ist, das für die Produktion von Herpes Simplex Viren verwendet wird. Es werden keine BAC DNA Präzipitate gebildet, die die Aufnahme der DNA durch die Zellen verhindern. Our laboratory is engaged with the development of herpesvirus vectors for gene and tumor therapy. As a basis for vector design HSV-1 genomes cloned as bacterial artificial chromosomes are used. After Red/ET- and FRT-mediated Flp recombination, the altered BAC genomes are transfected into BHK-21 cells for reconstitution of infectious virus and functional analysis. According to our experience there exist only few reliable reagents and reagent combinations, respectively, that allow a more or less efficient transfection of high molecular weight DNA into eukaryotic cells. In this context, in the present report we have examined the applicability of Metafectene Pro. Since reconstituted virus can be easily followed up by virus plaque formation after transfection, we have applied a recombinant HSV-1 BAC that induced a GFP membrane fusion protein with a Tet-off/Tet-on system for in situ monitoring of the transfection efficiency. Metafectene PRO, a polycationic liposomal transfection reagent, was a gift of Biontex Laboratories GmbH (München, Germany). Dulbecco’s modified Eagle’s medium (DMEM), fetal bovine serum (FBS), penstrep, and Opti-MEM I were obtained from Gibco (Karlsruhe, Germany). The baby hamster kidney cell line BHK-21 (clone 13) was a gift of Prof. J. Subak-Sharpe (Medical Research Council, Glasgow), and was cultured in DMEM supplemented with 5% FBS and penstrep. HSV-1 ANG BAC RRgBG (Fig. 1) was a derivative of HSV-1 ANG BAC that contained within the deleted ribonucleotide reductase gene region a tet-regulation cassette in which the enhanced green fluorescent protein (EGFP) gene was fused in frame with N- and C-terminal sequences of the HSV-1 glycoprotein B (gB) of strain ANG giving rise to a fusion protein consisting of 71 N-terminal residues of gB, followed by 239 residues of EGFP, and 215 C-terminal residues of gB. For transfection, 2 x 105 BHK-21 cells were seeded per 12-well containing 1 ml of DMEM/5% FBS one day before transfection, and used at approximately 50% confluence. Immediately before transfection cell monolayers were replenished with 1 ml of fresh DMEM/5% FBS. BAC DNA at 0.5 and 1.0 µg concentration was dissolved in 50 µl Opti-MEM I. At the same time different aliquots of Metafectene PRO were also dissolved in 50 µl Opti-MEM I. Complexes were formed by mixing DNA with Metafectene PRO solutions. After incubation for 30 min at room temperature, Metafectene PRO complexes with DNA were added dropwise in a volume of 100 µl per well. For fusion protein induction, Tet-on inducing antibiotic was added, and after gently shaking, cell monolayers were incubated at 37°C until examination. Phase contrast as well as fluorescence microscopy was applied to determine the transfection efficiency using a Leica DMIL fluorescence microscope, and for imaging a Leica DFC350 FX black-and-white camera together with the Leica Software FireCam 1.2.0 (Leitz, Wetzlar, Germany). 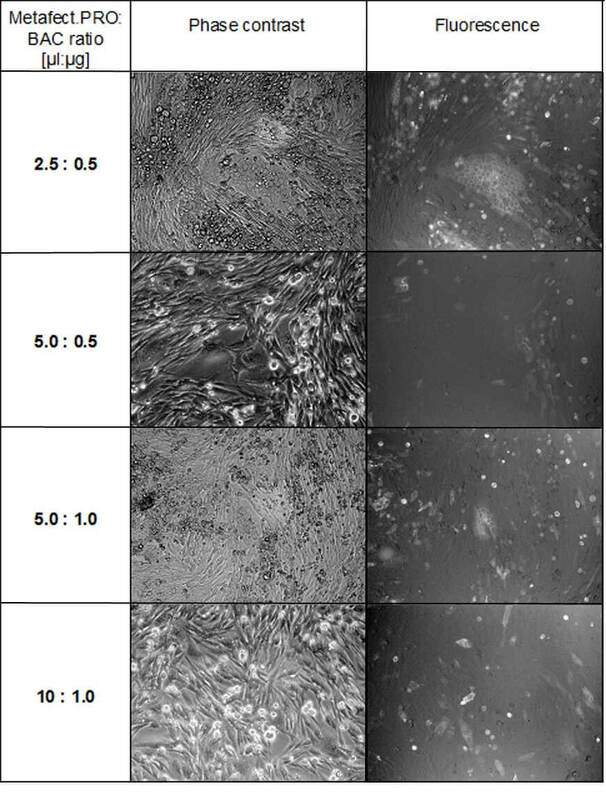 Several images were taken per transfection well and method. Figure 1. Structure of HSV-1 ANG BAC RRgBG. Depicted is the linear HSV-1 genome with the insertion sites of a floxed BAC episome containing a functional gpt gene for selection, and of the tet-regulated gB/EGFP expression cassette. DRR, deleted ribonucleotide reductase genes UL39 and UL40; TRL, terminal repeat sequence of the L-region; TRS, terminal repeat sequence of the S-region; lox P, recognition signal for Cre recombinase, FRT, recognition signal for Flp recombinase; P cmv, immediate early promoter of human cytomegalovirus; 2tetO, 2 copies of tet-operator sequences; gB, HSV-1 ANG glycoprotein sequences; EGFP, enhanced green fluorescent protein; tetR, tet repressor. Metafectene PRO was complexed with HSV-1 ANG BAC RRgBG at reagent:DNA ratios of 2.5 µl:0.5 µg, 5 µl:0.5 µg, 5 µl:1 µg, and 10 µl:1 µg. By far more and larger syncytial virus plaques and more extended expression of gB/EGFP fusion protein were obtained at the lowest examined reagent:DNA ratio, with 2.5 µl Metafectene PRO:0.5 µg BAC DNA (Fig. 2). No improvement in virus plaque formation and gB/EGFP expression was achieved by just adding twice the amount of complexes, that were prepared from mixtures of 5 µl Metafectene Pro and 1 µg BAC (Fig. 2, row 3). At higher Metafectene PRO concentrations, the gB/EGFP expression was significantly reduced. In addition, a slight cell toxic effect was noted by a partial loss of intact monolayers and the appearance of rounded cells that preferably occured at higher Metafectene PRO to BAC DNA ratios (5:0.5 and 10:1.0, Fig. 2). Figure 2. Syncytial virus plaque formation of BHK-21 cells after HSV-1 ANG BAC RRgBG transfection at the indicated BAC:Metafectene PRO ratios. Phase contrast and fluorescence images were taken 2 days after transfection and induction using a 20x power objective as described. Metafectene PRO highly qualifies for the transfection of large DNA such as HSV-1 BAC genomes with a size of about 153 kbps. Its handling is easier than comparable two-component systems. Less reagent was needed, and more important, no large BAC DNA precipitates were formed that occur readily with competitor reagents, and inhibit the cellular uptake of BAC DNA. The adherent toxicity problem may be overcome by a medium change within 12 to 24 h after transfection.